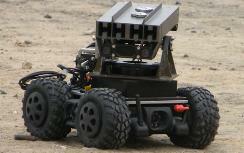 New robotic system developed by Rafael shoots fiery darts that burn up IED explosive charges. 'Trophy' tank defense system going operational. 'Pincher,' a new robotic system designed to disable improvised explosive devices (IEDs) from long distances is in development at Israel's Rafael Advanced Defense Systems, and another defensive system, the Trophy active defense for tanks, is in its pilot phase. Ram Fabian, director of Rafael's Land Warfare Systems, told Defense Update that the 'Pincher' is currently in prototype phase and could become operational next year. Pincher fires pencil sized pyrophoric rockets at the charge, causing it to burn instead of exploding and thus eliminating the risk of shrapnel.